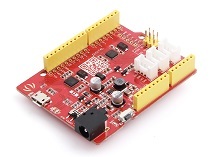 This Grove - Ultrasonic ranger is a non-contact distance measurement module which works at 40KHz. 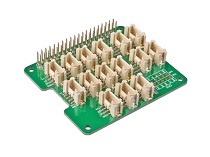 When we provide a pulse trigger signal with more than 10uS through singal pin, the Grove_Ultrasonic_Ranger will issue 8 cycles of 40kHz cycle level and detect the echo. The pulse width of the echo signal is proportional to the measured distance. Here is the formula: Distance = echo signal high time * Sound speed (340M/S)/2. 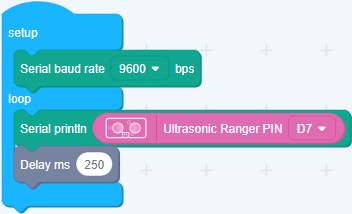 Grove_Ultrasonic_Ranger's trig and echo singal share 1 SIG pin. Do not hot plug Grove-Ultrasonic-Ranger, otherwise it will damage the sensor. The measured area must be no less than 0.5 square meters and smooth. Step 2. Connect Ultrasonic Ranger to port D7 of Grove-Base Shield. 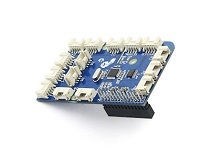 If we don't have Grove Base Shield, We also can directly connect Grove_Ultrasonic_Ranger to Seeeduino as below. Step 1. Download the UltrasonicRanger Library from Github. Step 3. Copy the code into Arduino IDE and upload. If you do not know how to upload the code, please check how to upload code. Step 4. We will see the distance display on terminal as below. Step 1. 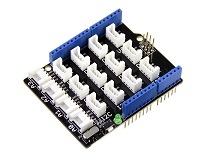 Connect a Grove - Ultrasonic Ranger to port D7 of a Base Shield. When the code finishes uploaded, you will see distance displayed in Serial Monitor. Step 3. Connect the Grove - Ultrasonic Ranger to port D5 of the Base Hat. 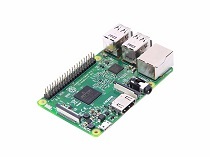 For step 3 you are able to connect the ultrasonic ranger to any GPIO Port but make sure you change the command with the corresponding port number. Following is the grove_ultrasonic_ranger.py code. Step 3. 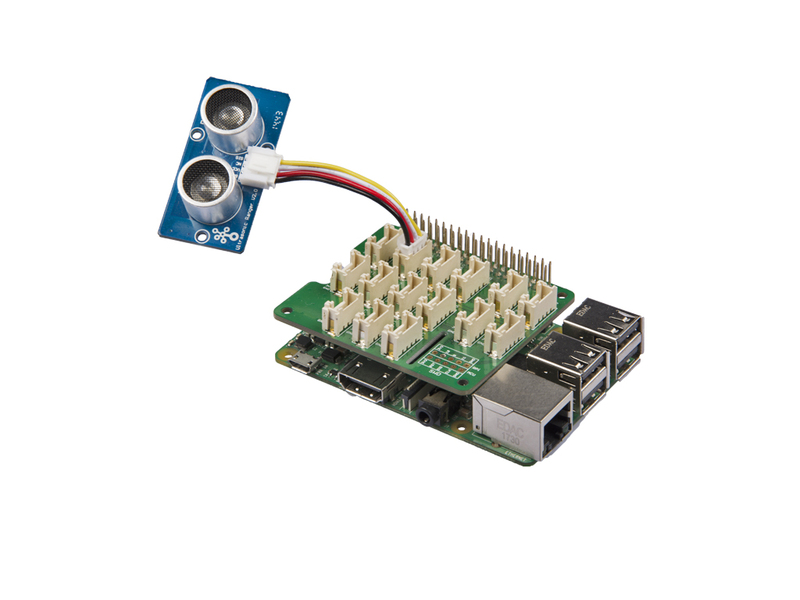 Connect Grove-Ultrasonic ranger to D4 port of GrovePi_Plus. Step 3. Excute below commands to use the ultrasonic_ranger to meansure the distance. Here is the grove_ultrasonic.py code. 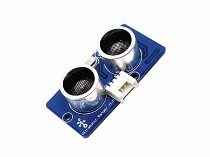 Q1: How does the Grove-Ultrasonic sensor work? A1: When we provide a pulse trigger signal with more than 10uS through singal pin, the Grove_Ultrasonic_Ranger will issue 8 cycles of 40kHz cycle level and detect the echo. The pulse width of the echo signal is proportional to the measured distance. Here is the formula: Distance = echo signal high time * Sound speed (340M/S)/2. Q2: Why Grove-Ultrasonic sensor only has 1 signal pin, comparing with other ultrasonic sensor Trig and Echo pins? A2:Grove_Ultrasonic_Ranger’s trig and echo signal share 1 SIG pin through MCU. Q3: Where can I find technical support if I have some other issue? 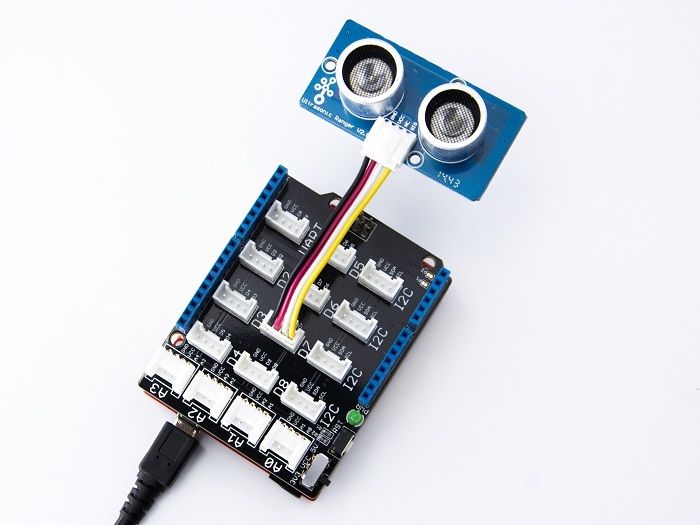 Q4: Can we connect mulitule ultrasonic to one arduino? 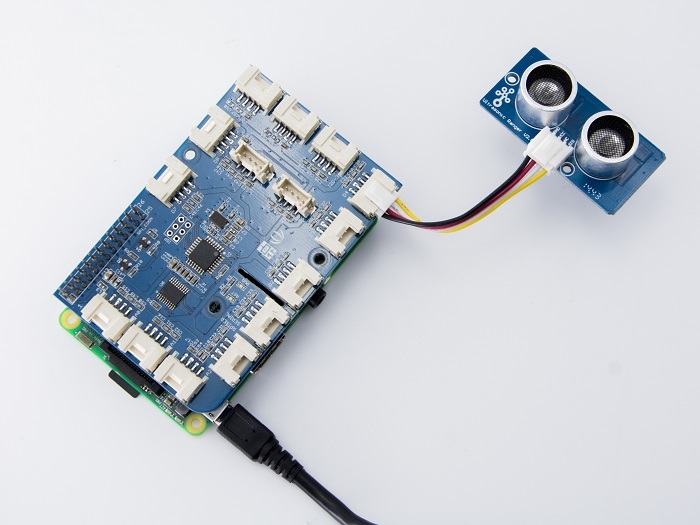 A4: Yes, Here is the example, one sensor is connected to D2 and other to D3. Hacking the Stairs at Seeed's New Office: Turn the stairs at the office into an interactive installation, and even a cool way to convey the message "STAFF ONLY" to visitors.